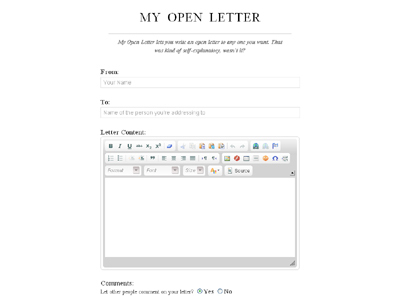 Myopenletter.in is a simple web app that lets you to write an open letter to any one you want in the world. There is no sign up, registration stuff. You can simply enter From Name and To (the addressing person) and start writing the open letter. You can edit, delete and also your open letter will be given a unique URL to share with friends and family. Just no signups, registration stuff. Come, start writing the letter directly. have fun with no time.